Azure Application Insights displays data about your application in a Microsoft Azure resource. Creating a new resource is therefore part of setting up Application Insights to monitor a new application. In many cases, creating a resource can be done automatically by the IDE. But in some cases, you create a resource manually - for example, to have separate resources for development and production builds of your application. After you have created the resource, you get its instrumentation key and use that to configure the SDK in the application. The resource key links the telemetry to the resource. You also need a subscription to Microsoft Azure. If your team or organization has an Azure subscription, the owner can add you to it, using your Windows Live ID. You're only charged for what you use. The default basic plan allows for a certain amount of experimental use free of charge. When you've got access to a subscription, log in to Application Insights at https://portal.azure.com, and use your Live ID to login. Application type affects what you see on the overview blade and the properties available in metric explorer. If you don't see your type of app, choose General. Subscription is your payment account in Azure. Resource group is a convenience for managing properties like access control. If you have already created other Azure resources, you can choose to put this new resource in the same group. Location is where we keep your data. 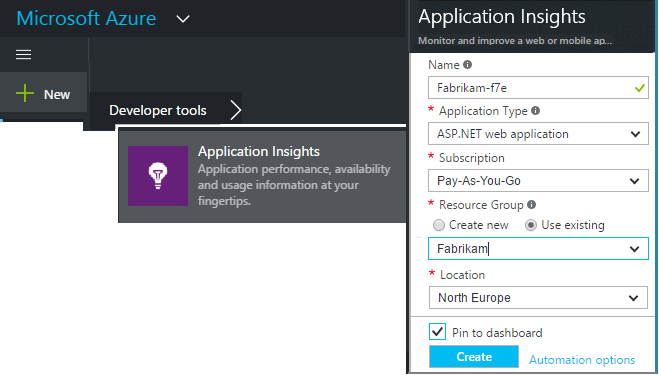 Pin to dashboard puts a quick-access tile for your resource on your Azure Home page. Recommended. When your app has been created, a new blade opens. This blade is where you see performance and usage data about your app. To get back to it next time you log in to Azure, look for your app's quick-start tile on the start board (home screen). Or click Browse to find it. The instrumentation key identifies the resource that you created. You need it to give to the SDK. Install the Application Insights SDK in your app. This step depends heavily on the type of your application. Use the instrumentation key to configure the SDK that you install in your application. The SDK includes standard modules that send telemetry without you having to write any code. To track user actions or diagnose issues in more detail, use the API to send your own telemetry. Close the quick start blade to return to your application blade in the Azure portal. Click the Search tile to see Diagnostic Search, where the first events appear. If you're expecting more data, click Refresh after a few seconds . You can write a PowerShell script to create a resource automatically.